Rotageek allows Payroll Codes to be added to Timesheets to help you process Payroll more quickly. You can assign specific Payroll Codes to individual Timesheet entries, or you can assign them to specific hours within that entry. For example, out of an 8 hour shift, an employee may have worked 6hrs at their contracted rate and 2 hours overtime. 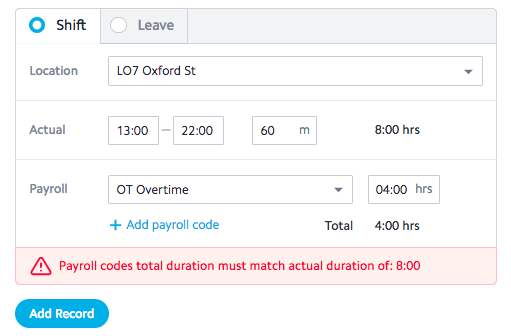 You can attach the relevant Payroll Codes to the hours within that shift. To edit Payroll Codes for a Timesheet record you want to click on the entry and pull up the side window. Here you should see the option to + Add payroll code. Here you can select the Payroll Codes you need and set how many hours they apply to. The total duration must equal the total number of hours worked in that entry, as you can see, this will be flagged if the hours do not match. You will not be able to approve the entry if the hours do not match. These codes will then appear in the file that is sent over to your Payroll department for them to check.